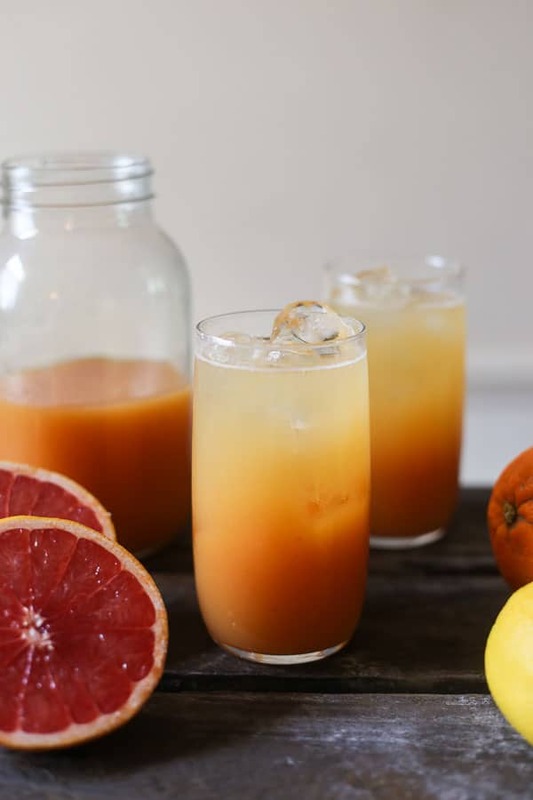 Triple Citrus Shrub is a wonderful way to start your day. Fresh orange, lemon and grapefruit puree smartened up with raw apple cider vinegar for all its health benefits and a good glug of honey to sweeten up the proceedings. 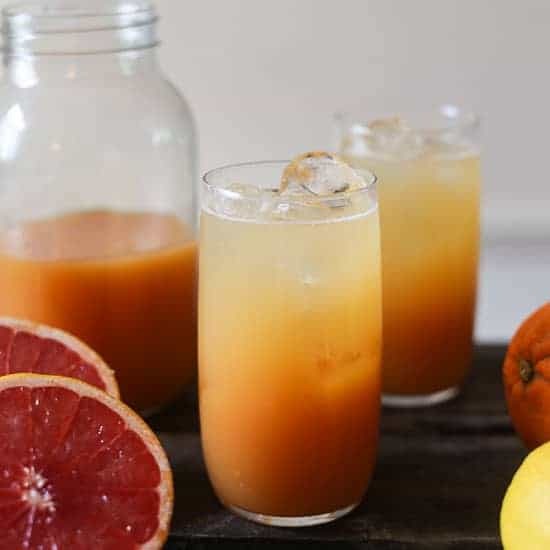 I have been beginning every morning with a generous glass of Triple Citrus Shrub to help aid my digestion, provide me with the necessary vitamin c to ward off this ghastly flu that is doing the rounds and generally because it is pretty delicious. If you are unfamiliar with a shrub, it is a specially brewed drinking vinegar. Originally produced to preserve the fruit juice of the season, they can also be made with alcohol instead of the vinegar, but that makes a very different kind of shrub that probably isn’t going to be your first choice to accompany your breakfast toast. 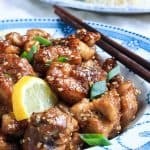 The recipe can be pretty basic by just steeping together fruit, vinegar and sugar and if you have used enough vinegar and sugar it can keep for an absolute age in the fridge. Depending on how much you like the zingy vinegar taste you can dilute your shrub as much or as little as you like. I found that I started out diluting it a lot then got a little bit more generous in my fingers of shrub as I got more and more into it. I mentioned at the top that I have been drinking my shrub to aid digestion and that’s because I have been really suffering with horrible acid reflux for the past couple of months of this pregnancy. I am trying to avoid drinking copious amounts of Gaviscon or bicarbonate of soda to ease it (as I did when I was pregnant with Cole) as it plays havoc with your gut and so I’m trying all sorts of natural remedies to counteract it instead. So far I’ve got off pretty lightly this pregnancy with my complaints (save the initial morning sickness) but this acid reflux is really getting me down as it’s making me dread eating or drinking since anything seems to be sparking it off. So here comes the shrub. I had been drinking diluted apple cider vinegar in the mornings which among its many health benefits like reducing blood sugar levels is said to aid digestion. This is due to buying the raw unfiltered vinegar which contains the ‘mother’ which is a by-product of the fermentation process and contains lots of healthy proteins, enzymes and friendly bacteria to help repair your gut. However, I had not been getting on so well with the apple cider vinegar as it seemed to be producing an initial heartburn which wasn’t pleasant. 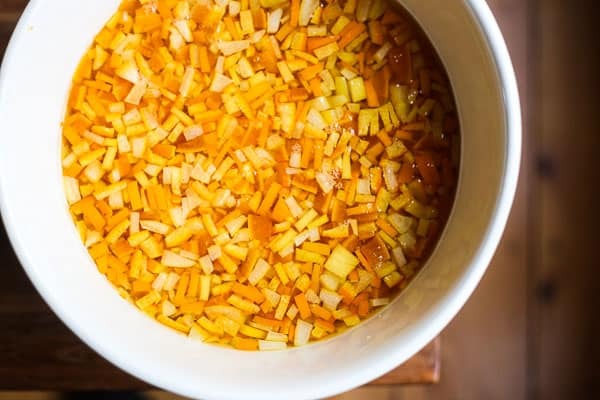 So when I found myself with copious amounts of orange, lemon and grapefruit flesh going begging as a result of my Homemade Mixed Peel I tried my hand at turning it into a very basic shrub to help the apple cider vinegar be ingested more pleasurably. The experiment has been great. I am a great believer that if something is working for you then it works and don’t question it too closely. I am not by any means a nutritional therapist but I am feeling better drinking my shrub everyday, whether it’s the placebo effect or is actually doing something pretty beneficial to my gut is beyond my knowledge but it is delicious and you can’t knock the amount of vitamin c that the shrub contains and so far (touch wood!) I have yet to have a cold this winter. 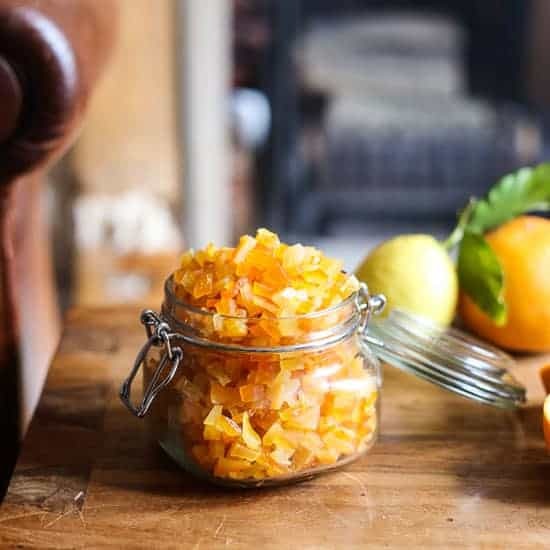 I didn’t make my shrub in any traditional way as by the time I started properly investigating the recipe then I had already blitzed up all my fruit flesh in the blender and it was too late to steep the whole citrus segments in the vinegar which is what I learnt later I should have done. However, the method I did use was quick, easy and produced a shrub that was available to drink straightaway. 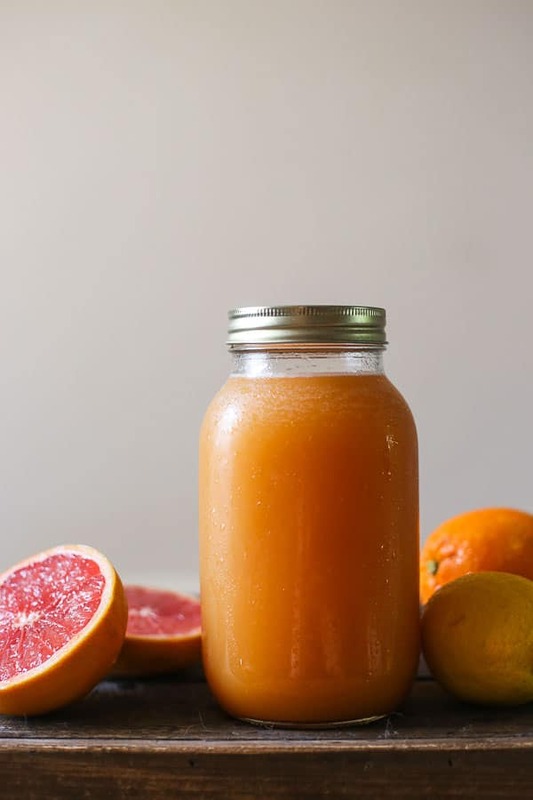 All I did was blend the citrus flesh, boil up the puree with a good amount of honey, re-blend the sweetened fruit with the vinegar and pour it into a kilner jar to store in the fridge. You can dilute the shrub any way you see fit. In the mornings I am happy with a quarter part shrub whisked in with three quarters cold water. However, I have also been finding in the evenings that if I mix the same amount of shrub with three quarters sparkling water then I have my very own healthy fancy cocktail. If I’m feeling especially exotic I have been known to add a sprig of mint in to really jazz it up. 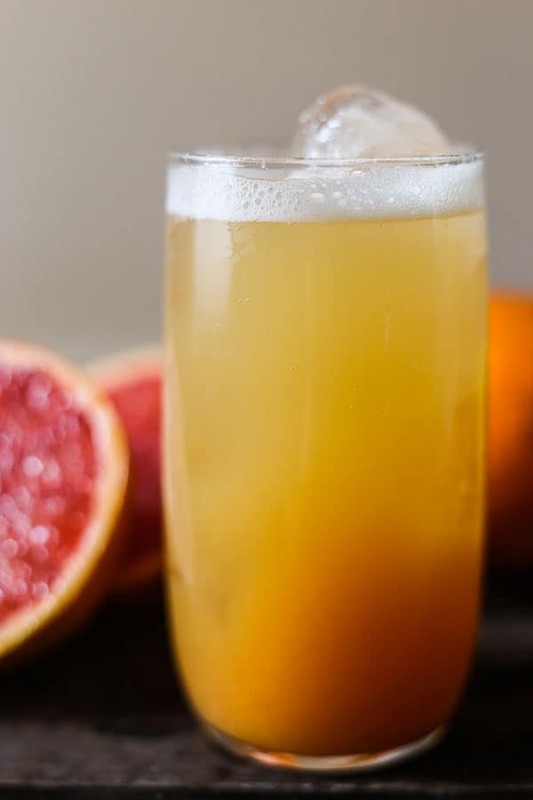 Homemade shrubs are a favourite of mixologists at the moment as they can create really excitingly flavoured cocktails and I can totally see why with all the tangy sweet and sour notes going on. For now though, I can feel pretty saintly as I drink it. Talk to me in a few months though when I am free to glug a bit of gin into my shrub as well. Still perhaps, not at breakfast time. Carefully remove the peel, pith and seeds from the fruit until you are left with only the flesh. 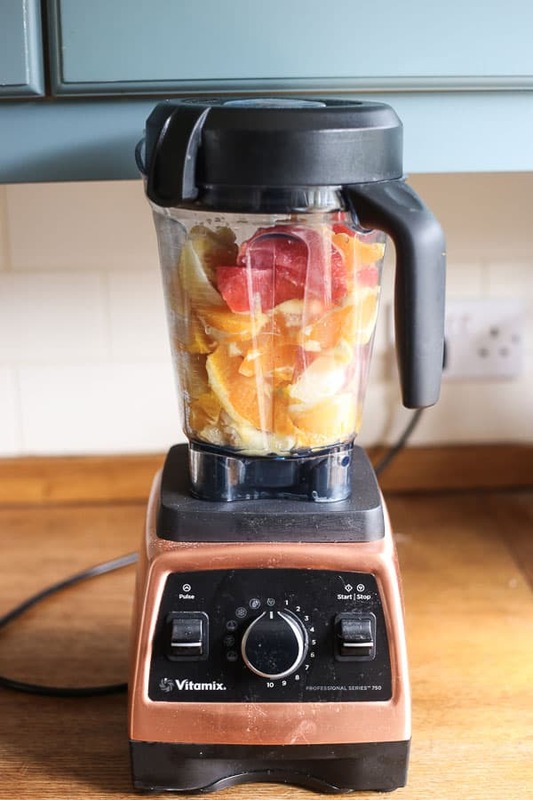 Place all the fruit flesh into a blender and blitz until smooth. You should have about 1 litre of fruit puree. Pour the fruit puree into a saucepan along with the honey, whisk them together and heat gently until boiling. Remove from the heat and pour back into the blender. Pour in the apple cider vinegar and blitz for a minute or so until mixed completely. Pour into a large jar and leave to cool then store in the fridge. The shrub can be kept in the fridge for up to a month. which was a birthday present from Luke back in December. Words cannot express how much I love it, it’s my new kitchen baby. 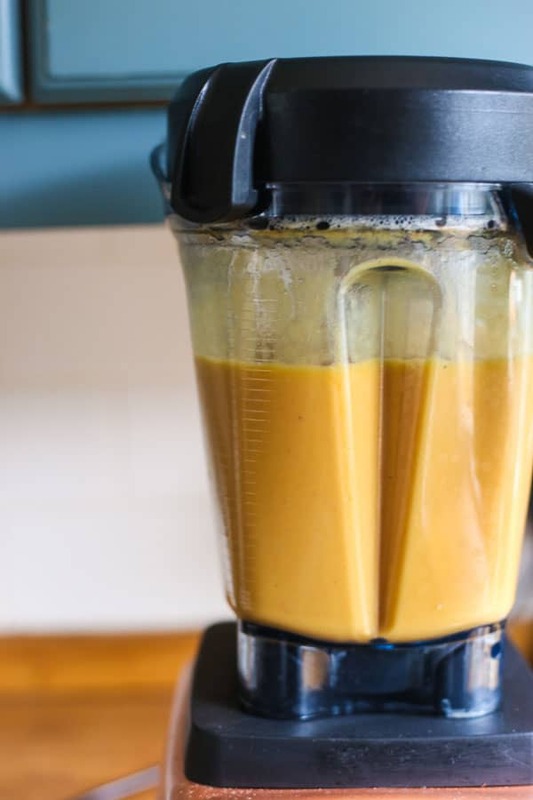 It makes the most deliciously smooth smoothies, healthy green soups and date purees for baking. I am in no way sponsored by Vitamix, I just love my new toy. which I used in this shrub, the Vinegar Cake I am posting about next week and every day uses like salad dressings and marinades. It’s very delicious and supposed to be very good for you too. The Amazon links above are affiliate links which means if you click through to buy then Amazon gives me a small commission at no cost to you whatsoever. I will only recommend products I use in my kitchen and love. It’s just a way for me to fund my shopping list for the blog so if you do click through then many thanks!! Homemade Mixed Peel is so much more flavourful than supermarket bought. 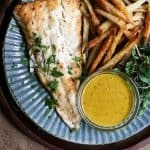 It isn’t as bitter and has a more fully rounded flavour that captures the essence of citrus season. Until recently I didn’t use a lot of mixed peel in my baking. Instead if a recipe called for it I simply swapped in the zest of an orange and lemon or perhaps even a tablespoon of marmalade. That’s because mixed peel is one of the ingredients that Luke abhors. He can taste it a mile away so it has been useless to hide it within my fruit cakes as he would simply reject it upon first bite. He also knows which bakery adds mixed peel to their Eccles Cakes, his favourite treat, and takes his custom elsewhere. So mixed peel had been relegated from all baking in our household and substitutions relied upon instead. Mixed peel is one of those ingredients that is featured in a lot of British baking, from traditional fruit cakes like Dundee Cake or Christmas Cake to tea time fare like the aforementioned Eccles Cakes or Hot Cross Buns. Mixed peel is basically candied lemon and orange peel. Eighteenth century bakers knew that the most intense flavour of any citrus fruit is derived from the peel. 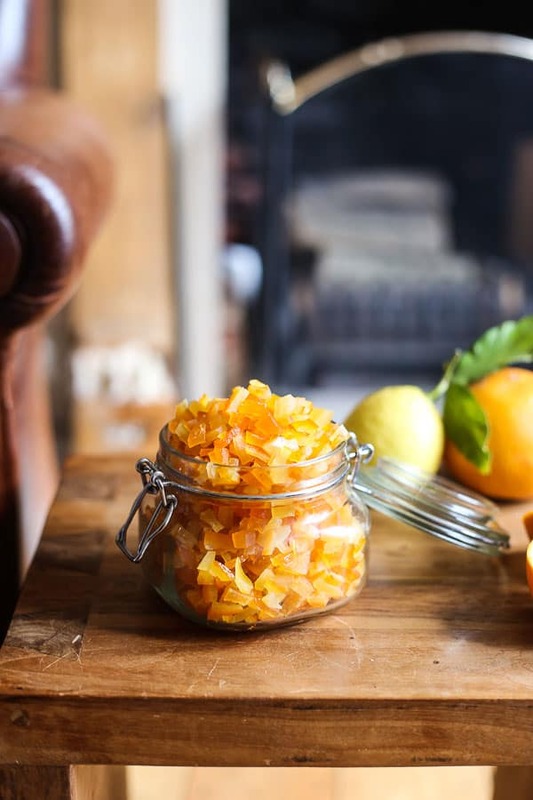 So intent on capturing as much flavour as possible in their recipes and mindful of preserving since fresh fruit was scarce, the peel was candied, dried and stored until needed. 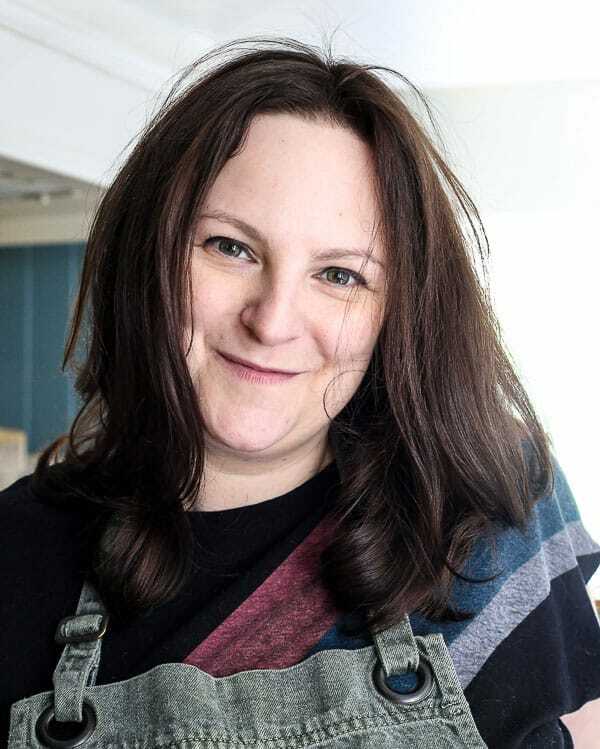 These traditional recipes are now the backbone of British baking so mixed peel has been handed down to us in our grandmothers’ and great great grandmothers’ recipes often when dried fruit is called for. Earlier this month I was recipe testing one of my Auntie Lil’s classic cakes, She was a bit of a baker and her Vinegar Cake, which was her traditional everyday fruit cake, was legendary. I have had the recipe tucked into my recipe file for years now and recently I have been attempting to recreate an authentic gluten-free version of her renowned cake. Auntie Lil’s recipe, like a lot of traditional fruit cakes, calls upon mixed peel as an ingredient. Since I wanted a result as near as the cake she baked for her young family I dutifully added mixed peel from the supermarket along with the other dried fruit it asked for. At first bite I couldn’t work out why the cake tasted so horribly bitter, there was almost a sourness that butted up against the soft plump sultanas and raisins which was distinctly and acidically unpleasant. It soon became apparent that in my enforced abstinence from mixed peel I too had developed a dislike for it. But how could that be? I love citrus, I love the brightness of intense lemon and orange peel. There should be no reason why mixed peel doesn’t appeal to me too. But the supermarket stuff, when tasted by itself is just not that nice. So I set about making my own. And since I now had dominion over the mixed peel I added grapefruit peel as well to add a third dimension of citrus to the proceedings. Much like my Homemade Glacé Cherries, when you make it yourself there is absolutely no comparison to the shop bought stuff. You could eat Homemade Mixed Peel by the spoonful. In fact since I made so much Cole and I have been dipping our hands into the jar and taking out small sticky handfuls at snack time as a little treat. 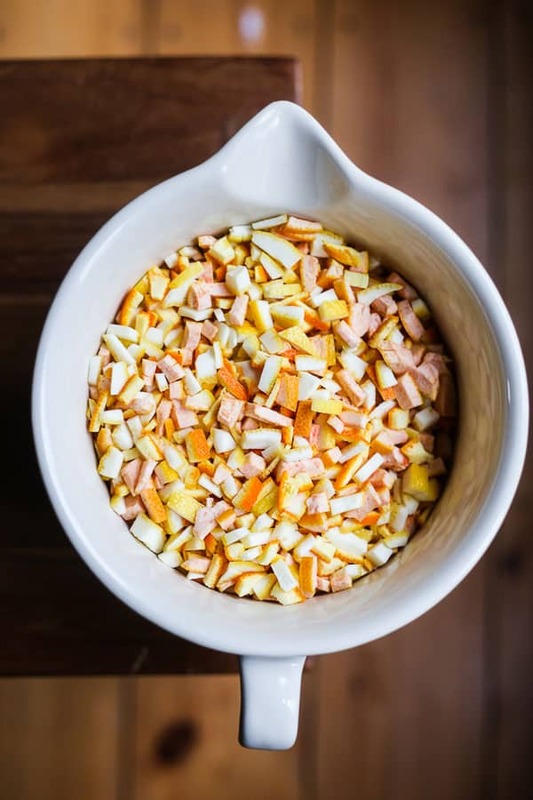 Making Homemade Mixed Peel is a labour of love and requires about a week of soaking it in a sugar syrup, draining it from the liquid, boiling the sugar syrup down and re-soaking the peel multiple times. Although the really trying time comes after the mixed peel has been drained of the sugar syrup and then needs to dry in a sterile environment for about a week. I dried mine in my switched off oven but since I use my oven almost every day it has required a lot of patience not to bottle the peel earlier just to get it out of the way. I definitely need to invest in a dehydrator for this purpose. When I do I’ll make the recipe again and let you know how it goes. Suffice to say that when it came time to recipe testing Auntie Lil’s Vinegar Cake with the Homemade Mixed Peel the results were pretty on the money. Gone was the nasty bitterness, instead the lovely fragrance of sharp citrus permeated the cake and sat comfortably alongside the rest of the ingredients. The recipe has been a triumph and I’ll be sharing it soon, so stay tuned. And as for Luke, he has conceded that if I were to start using Homemade Mixed Peel in my baking then that wouldn’t be such a bad thing. Thumbs up indeed. 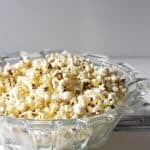 In the meantime if you are making this Homemade Mixed Peel you will find you have two delicious extra kitchen ingredients leftover from the recipe. 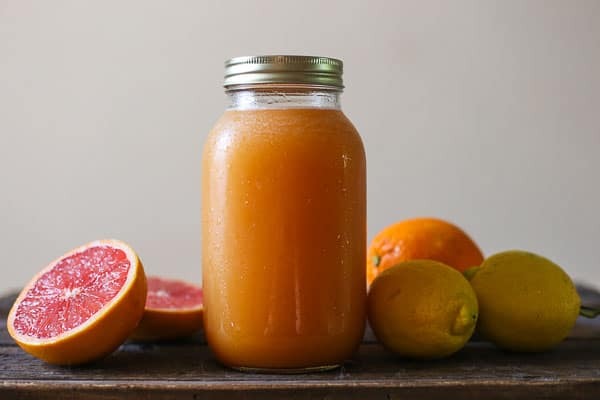 You will have copious amounts of citrus flesh from the beginning step once you have peeled the fruit, and also the most beautiful citrus sugar syrup from the end step once you have drained the peel away from its soaking syrup. Do not throw either away. 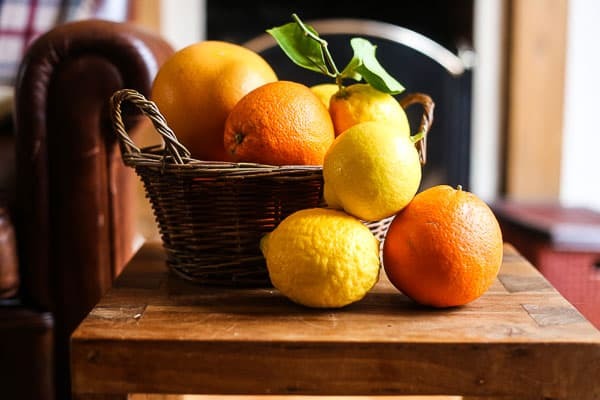 I’ll be posting a recipe for my Triple Citrus Shrub in the next few days to use up that citrus flesh and I’m working on a compendium of recipes to make the most of that delicious citrus sugar syrup which I’ll be sharing soon. If your fruit is waxed then you will need to wash off the wax from the skin of the fruit first by giving it a light scrub. Cut the oranges, lemons and grapefruit into quarters then with very sharp knife remove the skin from the pith and the flesh. Cut the peel lengthways again. 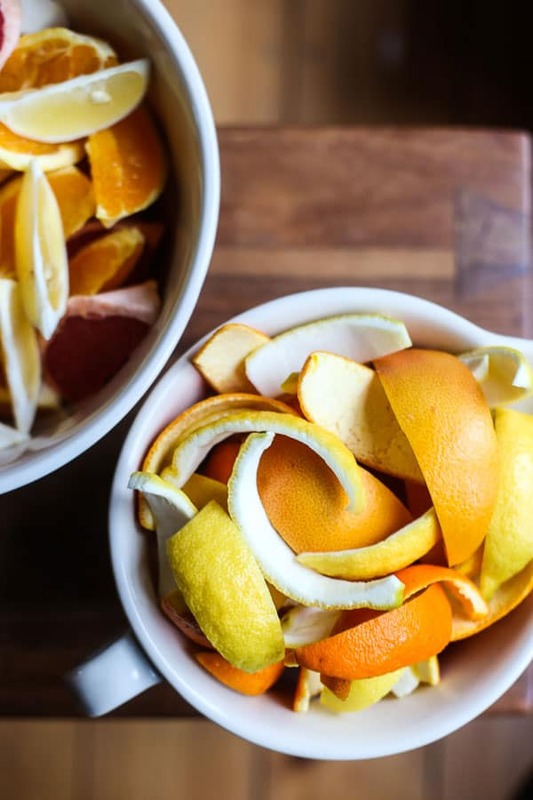 You might need to cut the lemon peel once, the orange peel twice more and the grapefruit peel three times more to get even sized pieces. Then cut widthways into short thin strips. Weigh the peel, you should have around 450g. Place the peel into a stainless steel saucepan with the cold water then bring to the boil. Turn the heat low and simmer for 1 hour. Remove from the heat and set a sieve over a large bowl. Pour the contents of the saucepan through the sieve, set aside the peel for one moment and weigh out the cooking water. Pour 1140ml of the cooking water back into the saucepan with 900g of the sugar. If you don’t have enough cooking water then just top up with tap water. Bring the sugar and water to a gentle boil and simmer for 10 minutes until the sugar has dissolved. Pour the sugar syrup over the peel, cover and leave the peel to soak for 24 hours. Strain the syrup into a large saucepan and return the peel to the bowl. Add the remaining 450g of sugar to the saucepan. Bring to a boil, then turn down to simmer for a couple of minutes making sure the sugar has completely dissolved. Pour the syrup back over the peel, cover and leave for another 24 hours. Pour the peel and syrup into a large saucepan. Bring to a boil, then turn the heat down to simmer for 30 minutes. Pour everything back into the bowl, cover and leave the peel to soak for four final days. Drain the fruit, place on a fine wire rack and leave in a sterile dry place until no longer sticky, such as a turned-off oven. Although leave a note on the oven that it is not to be used. The mixed peel can take as long as seven days to completely dry. 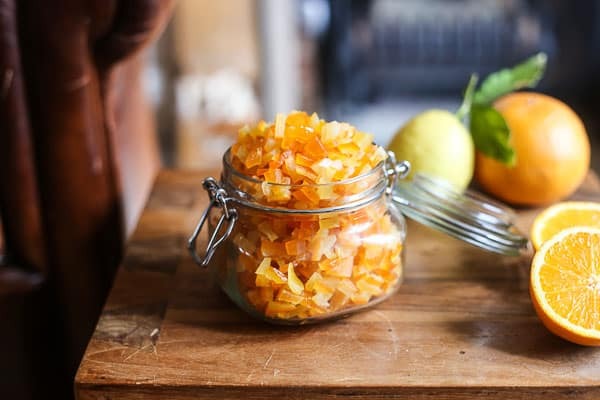 The best way to store the mixed peel afterwards is in sterilised glass jars and should keep for at least a couple of months. 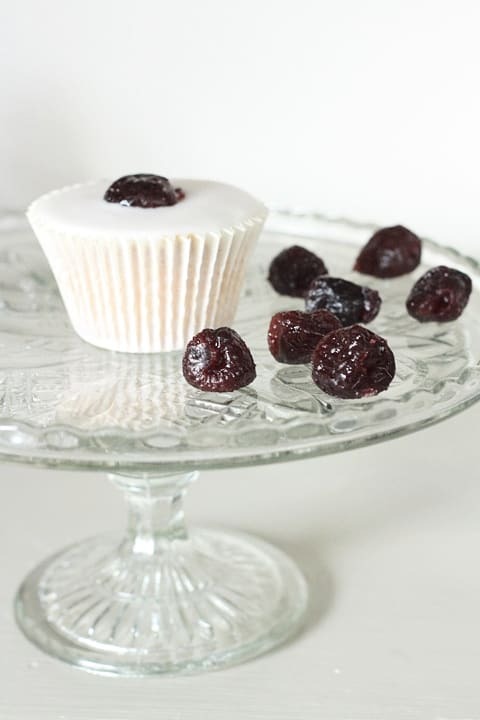 Have you tried Homemade Glacé Cherries yet? These Lemon and Poppy Seed Muffins are light, bright and zesty. Gloriously gluten-free but moist, bouncy and incredibly moreish. A friend commented that since I’m on a maternity break from the cake stall that I must have a lot less cake wastage in my house. Ha, I invited her to come and visit the muffin graveyard that was currently overtaking my kitchen. At that particular time when she made the innocuous remark I had about 35 Lemon and Poppy Seed Muffins crammed on top of my workspace that were begging for a home. These little guys were good muffins, every one of the six batches I made were fine but not quite the muffin I had in mind when I began my quest to come up with my ultimate gluten-free Lemon and Poppy Seed Muffin. With the cake stall all my bakes are tried and tested recipes which I have made many many times and perfected. I don’t sell out every week, although that is the aim and usually there is not much left. Rest assured though all the unbought cake goes to good homes afterwards as I offer it to my fellow stall holders who have braved the cold day alongside me. The cakes and bakes which I make for recipe testing though don’t always have such a happy ending as quite often I can be absolutely inundated with half-finished, mediocre tasting fare which haven’t reached the potential I had intended. A lot is given away but those that fall way below par end up in the bin. My current adventure to develop the perfect gluten-free Lemon and Poppy Seed Muffin can only be blamed on Cole. We were having lunch at a café together a couple of weeks ago when his head was turned by the collection of Lemon and Poppy Seed Muffins standing to attention on the counter directly in his eye line. Every muffin in different brightly coloured cases, the icing glinting from the sunlight strewn window. There was no doubt, these were toddler catnip. He mewed for one from the moment we sat down and feeling magnanimous I acquiesced that he could have one for dessert. As it turns out we were stuffed after our lunch but he still wanted a muffin so I got him one for later. Unfortunately they were not gluten-free so I went without. But the craving had set in and since we had no plans in the afternoon I decided that whilst he ate his muffin he could stand at our kitchen counter and watch whilst I showed him how to make the gluten-free version. Totally for his benefit you understand. So that’s what we did and it was great fun. However the end result wasn’t quite what I had intended, they were okay but the texture wasn’t right at all. 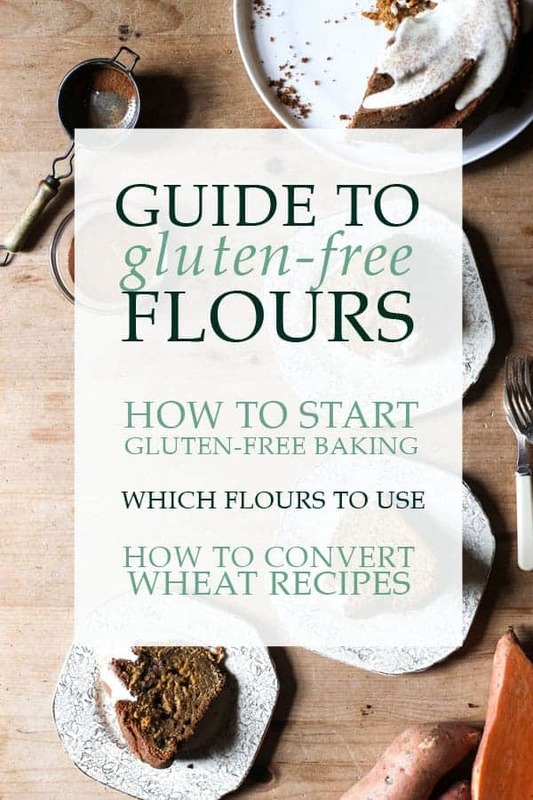 In my ratio of gluten-free flours I had obviously used far too much almond flour. They were not the light and fluffy muffin that I was hoping for, a bit dense and claggy and certainly not enough lemon. I ate one slightly disappointed, resolving to give the recipe another go the following day. 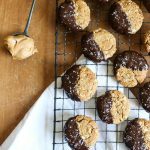 Two weeks and 60 muffins later I finally reached the ultimate goal and that’s the recipe I am sharing here. 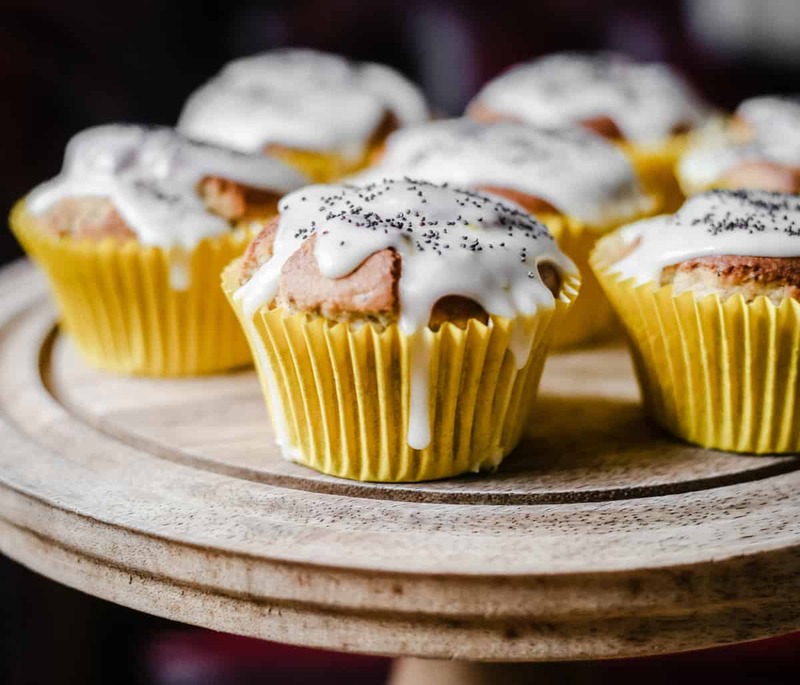 These Lemon and Poppy Seed Muffins are the perfect muffin to begin your day, break up your afternoon with alongside a cup of tea or treat yourself to after dinner. There is plenty of zest in the sponge which is fluffy from the collection of sweet rice flour, oat flour and almond flour. The top is drenched with a tangy lemon icing and sprinkled with more poppy seeds for a little crunch. Not only can I see these Lemon and Poppy Seed Muffins standing the test of time in our family but the recipe is so adaptable that you can easily swap out the lemon zest and poppy seeds for perhaps blueberries, orange zest or something more adventurous. I’m thrilled I cracked this muffin, as is Cole so he can now have Lemon and Poppy Seed Muffins on tap. The neighbours, however, might be a little sick of them. Place muffin cases in a 12-hole muffin tin and pre-heat the oven to 170°C. Place the milk, sugar, olive oil, eggs and lemon zest into a large bowl and beat together until smooth. In a separate bowl whisk together the sweet rice flour, oat flour, almond flour, poppy seeds, baking powder and salt until thoroughly combined. Add the flour mixture to the wet ingredients and beat together until smooth. Divide the batter into muffin cases, filling to just below the top. Place the muffin tin into the oven and bake for about 20 minutes. As soon as the muffin tin has been taken out of the oven, then lift out the muffins and leave on a cooling rack to cool completely before drenching with icing. Make the icing by beating together the lemon juice and zest with the icing sugar until the icing is just pourable. Spoon the icing over each muffin then leave to set. which is ultra fine flour and works perfectly in these muffins. 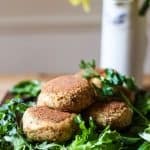 For more info on almond flour see my post on nut flours which gives the breakdown of the different between ground almonds, almond meal and almond flour.